When you look at your resume, it looks like the best marketing brochure. Your professional experience is a straight string of promotions, backed up with stunning achievements. Your education is top of the class and your references look like industry address book. Your skills in formatting shine through a beautiful layout and your resume is packed with appropriate keywords. There’s no chance that robots could cut out this beauty. However, you had your last interview four months ago and since then you didn’t get a single call from a recruiter. And you sent hundreds of job applications. Depressing, isn’t it? It’s time for you to check less obvious details of your resume. In this article, we’re going to pay special attention to your resume filename, one of the most common reasons why some finely crafted resumes never land interviews. Now, imagine the following situation. You’re a recruiter who received 389 emails as answers to a job post. You started opening emails and around a third of emails in total have attachments simply named resume.doc. Would you rename 130 files? What happens with resumes named ’resume.doc’ that are not outstanding but just good enough to end up in a ‘shortlisted’ pile? Can you guess? Let me tell you. They never get renamed. They never get opened again. They are forever lost in an electronic limbo on the servers of recruiter’s email provider. 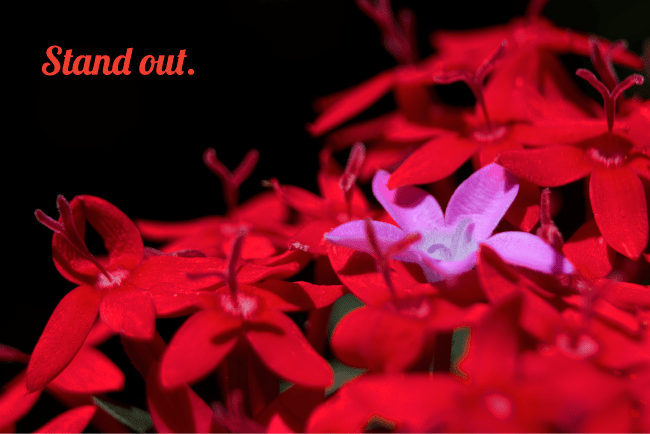 Don’t let your job hunt end even before it began because of a simple mistake. Resume.doc – We already explained why this is not a proper way to name a resume file. It could easily get lost in hundreds of same or similar filenames on a recruiter’s hard drive. Not just that, but your resume could be replaced with another one, named exactly like yours. Not capitalizing – Is it really so hard to press shift on your keyboard? Does it have to look so WhatsApp-ish? Writing in all lowercase is the sign of laziness and lack of seriousness in a professional world. Always properly capitalize words in your resume filename. Revision number 8 – Can you think of one single reason why should a recruiter be interested in a version number of your resume? Me neither. While it’s completely understandable to update your resume all the time, the recruiter doesn’t have to know that. Date or a year – Same as above with one additional danger. If a recruiter sees a date which is far in the past (where “far” is subjective assessment of a recruiter) he might think that you haven’t changed your resume i.e. haven’t done anything worth mentioning for a long time. Do you really want to make a first impression like that? Undivided string of words – Wouldyoureadthisarticleifitwaswrittenl ikethisalltheway? I don’t think so. Same goes for recruiters. Filename Johnstevensmith.doc is not an easy one to read and your job is to provide maximum comfort for a recruiter while he enjoys reading your resume. 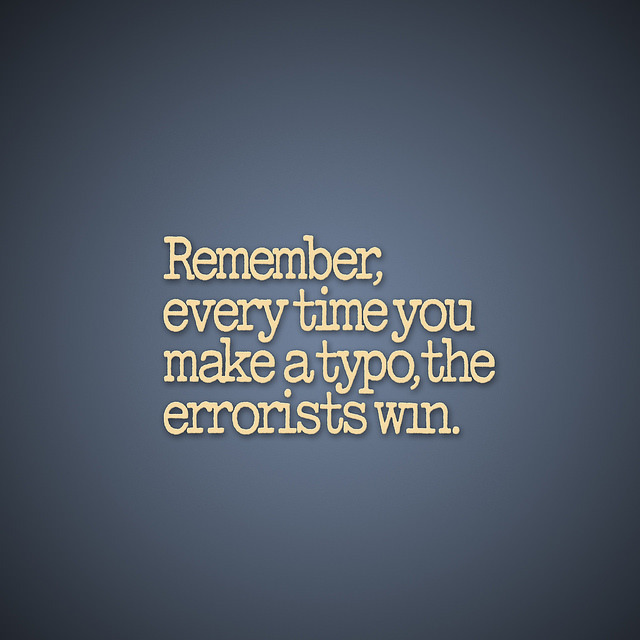 Misspelled words – One of the two unbreakable, set-in-stone rules for resumes is not to make typos. Same goes for resume filenames. If you put a name of the company you’re applying to into a filename, be sure to spell it properly. Same goes for any other word in a resume filename. Using nicknames – If you’re about to be presented to a CEO of Google, would you say: “I’m Johnny” or you would try to pronounce as clear as you can: “I’m John Stevens from [some company]”. Same goes with resume filenames. Try to leave the most professional impression you can. Have you found yourself in one of the aforementioned mistakes? Don’t worry. 80-90% of applicants make the same mistake all the time. 80-90%! Luckily, you’re reading this article and after applying the following advice you will already be in the top 10-20% of applicants, at least by resume filename. 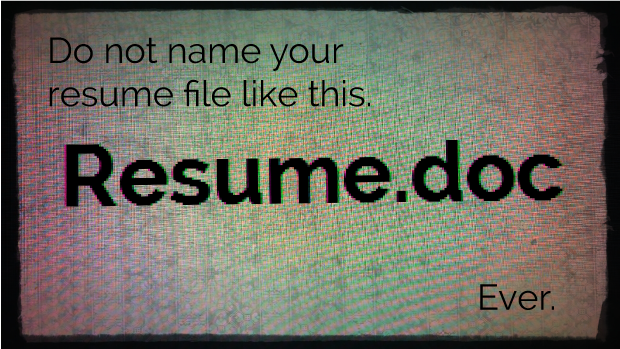 Let’s see the best practice for naming your resume file. If you perceive resume filename as an additional marketing space (which you should be doing), then it’s easy to perceive how to craft it. Start with your capitalized first and last name. Follow it with the word “Resume”. In the end, write a one to three keywords phrase. Your identity is clear and more memorable – Would you remember Johnresume.doc or John Smith Resume.doc? You clearly distinguish your resume file from your cover letter file. It’s searchable in recruiter’s database. Keywords phrase is perfect first-contact marketing. The \rcruiter automatically knows what to expect in a resume. Static marketing – In a folder full of Johnresume.doc files and similar generic filenames, John Smith Resume Top-ranked Sales Manager.doc stands out clearly. Every time the recruiter opens that folder your name and a short marketing phrase will scream directly at him calling to open the resume and call you for an interview. Another piece of advice, keep your filenames shorter than 25 characters. Some computer systems shorten all filename if they are over 24 chars. You don’t want to risk it. Not all recruiters have the latest technology. Some authors propose to divide words in a resume filename with underscore or hyphen. It’s plain ugly. Don’t do that. Divide words by spaces, as in any other document name. Who would say that such a small detail as a resume filename could lead to such catastrophic consequences if not managed properly? Well, welcome to the wonderful world of resume writing where landing a dream job and having a fantastic life in the following years could depend on a single glaring typo. The devil is in details. Never forget that when you’re preparing your resume. This is a great article, and one I considered myself recently. It is good to see I followed similar guidelines. One addition though – is there a benefit in STARTING the file name with Resume? If a potential employer is looking for a file on their desktop, for example, are they going to remember your forename to know where to find it amongst a mass of icons? At least this way they could start looking under R (or indeed CV in the UK). Thank you for your kind words, Stu. To be honest, I spent a decent amount of time thinking about that myself. I decided to go with the name first because it’s the good way to be memorized by recruiter. However, your point makes a lot of sense. Thank you for a valuable insight.